Subject to planning consent, the site, extending to 15.8 acres, provides a prime residential development opportunity in a sought after residential area. The property is located directly adjoining Northop Hall village. This semi-rural location benefits from a local shop, primary school, community centre, tennis court, public house and public transport. The market town of Mold is close by offering a further range of amenities including a choice of Welsh and English schools, a range of entertainment opportunities including Theatre Clwyd and a variety of recreational and sporting facilities. The city of Chester lies approximately 10 miles away providing a wider range of shopping, recreational and employment opportunities. The village is well served by transport links with the A55 providing ready access to the motorway network beyond. Shotton Station, some 2.3mile distant provides rail links to major centres. The gently sloping site, currently in agricultural use, fronts directly onto both Village Road and Brookside. The southern boundary adjoins the A55 but is well screened by an established tree belt. 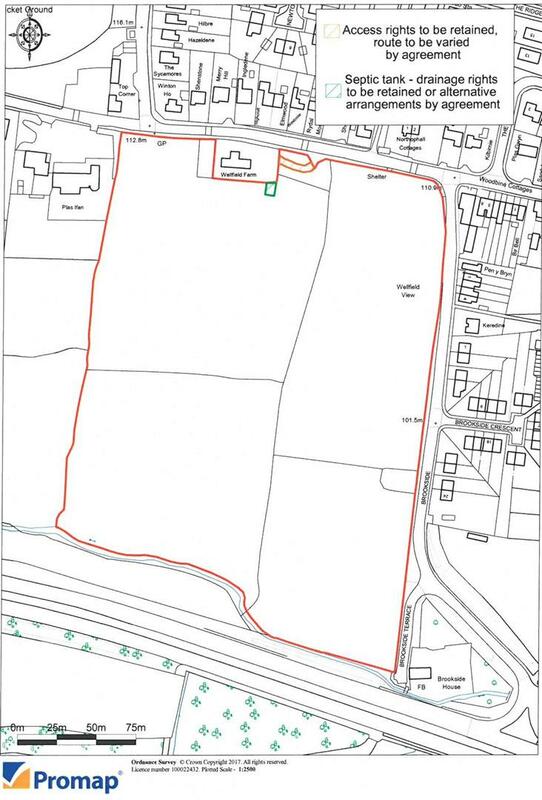 The site lies outside of but adjoining the Settlement Boundary of the Flintshire County Council Unitary Development Plan 2000-2015. The site has been submitted as a Candidate Site for inclusion within Flintshire Council s Local Development Plan. The vendor has not entered into detailed discussions with Flintshire Council. Wellfield Farmhouse is to be retained by the Vendors. A Right of Way for all purposes is to be retained to the property (route to be varied by agreement). Rights to maintain and replace are to be reserved (unless a suitable alternative is offered by the successful purchaser). All mains services are located nearby, however, prospective purchasers should make their own inquiries and investigations with the appropriate statutory undertakers to satisfy themselves as to the availability of adequate services. The vendors will undertake to provide vacant possession prior to completion. The land is offered on a conditional contract subject to a successful planning consent being obtained. The purchasers will be responsible for a contribution towards the vendor's surveyor s fees at 1.5% of the purchase price plus VAT. The purchasers will be responsible for a contribution towards the vendor s legal costs at �20,000 plus VAT. An undertaking for the costs will be required from the purchaser s solicitors upon agreement of Heads of Terms, to cover the Vendors costs in the event the purchaser fails to perform. Stamp duty land tax will be payable by the purchaser. VAT will be levied, if applicable, on the purchase price and the vendor s legal and surveyor's costs. The property is offered for sale by way of informal tender. The official tender forms are available from Jones Peckover, 47 Vale Street, Denbigh, LL16 3AR upon request. All tenders are to be submitted on the official forms and to be received by Jones Peckover, Denbigh by not later than 3pm on Friday 15th September 2017. It is important that all tenders are within sealed envelopes with Wellfield Farm marked clearly on the front of the envelope. It should be noted that the vendors are not bound to accept the highest, or indeed any tender. Planning & Highways Dept. : County Hall, Mold, Flintshire CH7 6NA (Tel: 01352-752121). Electricity: Manweb Plc, Manweb House, Kingfield Court, Chester Business Park, Wrexham Road, Chester (Tel: 0845-2721212). Water: Hyder, Allt y Ffynnon, Alltami, Mold, Flintshire (Tel: 01244-550015). Messrs Jones Peckover for themselves and for the vendors or lessors of this property whose agents they are give notice that:- 1. The particulars are set out as a general outline only for the guidance of intending purchasers or lessees, and do not constitute, nor constitute part of an offer or contract. 2. All descriptions, dimensions, references to condition and necessary permissions for use and occupation, and other details are given without responsibility and any intending purchasers or tenants should not rely on them as statements or representations of fact but must satisfy themselves by inspection or otherwise as to the correctness of each of them. 3. No person in the employment or Messrs Jones Peckover has the authority to make or give any representation or warranty whatever in relation to this property.